Such is the season here in Copenhagen. 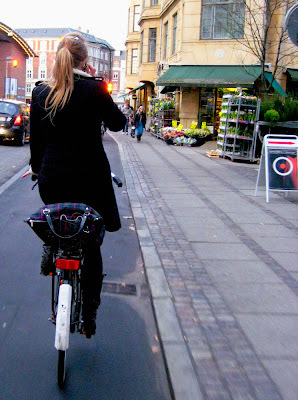 Long jackets, high boots, patterned bags and the everpresent wonky old Raleigh bike. As probably mentioned before, talking on your mobile phone is a fineable offence but it is rarely enforced. the good thing is that Copenhageners are so used to riding that you rarely have problems overtaking a chatty biker on the bike lanes - it is, however, rather unwise to use them at intersections, we find. I love her extended pinkie on the left. Making a point in the conversation, I assume.